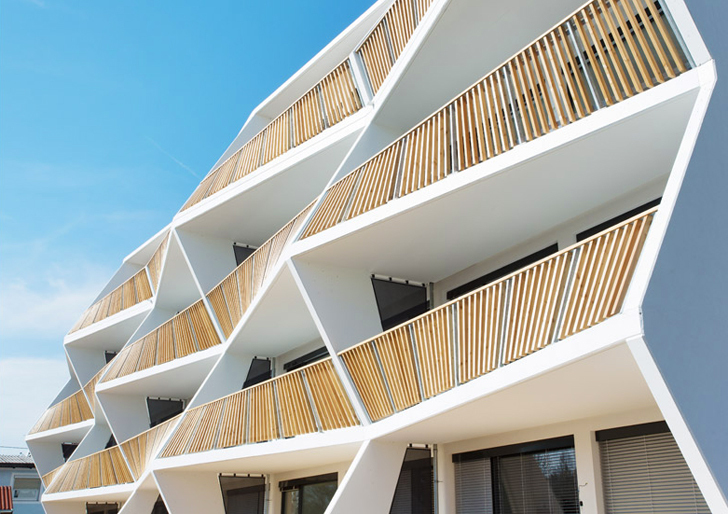 Love Architecture and Urbanism transformed their affordable apartment block on Ragnitzstrasse 36 in Graz, Austria, into a playful structure with zig-zagging sculptural balconies. The building’s dynamic south-facing façade has larch wood railings placed in a fan-like manner that creates a homely atmosphere. Hit the jump for more details. The building comprises 15 small apartments and a penthouse on the top floor. Oriented to the south, the apartment balconies have a cantilevered slab and are partially covered. Running along the zig-zag-shaped balconies are the larch-wood railings that change orientation and angles in a fan-like way and create a soft dynamic appearance. Besides their aesthetic function, the balconies are meant to make the smaller apartments look bigger from the inside. With living units ranging from 430 to 538 square feet, the balconies add another 182 square feet of space. The north-facing façade toward Ragnitzstrasse includes a pergola that reduces traffic noise and is mounted in a way that makes it look almost transparent from the west. Structurally simple and efficient, the building boasts inexpensive building components and has a feel of customized, homely living units. The building comprises 15 small apartments and a penthouse on the top floor. Oriented to the south, the apartment balconies have a cantilevered slab and are partially covered. 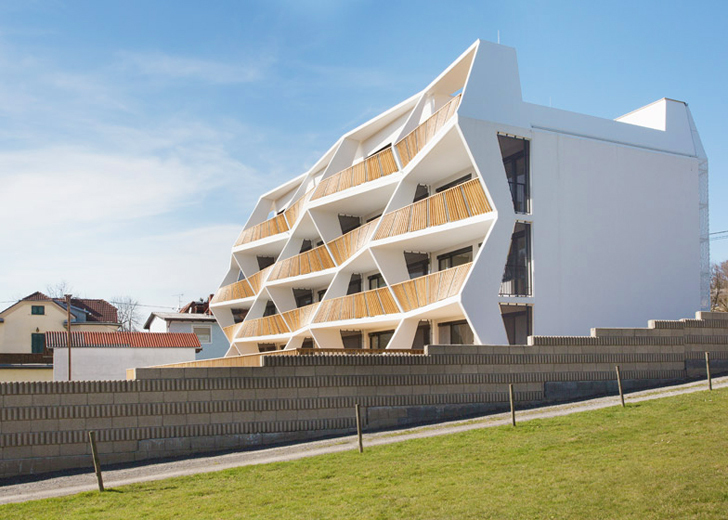 Running along the zig-zag-shaped balconies are the larch-wood railings that change orientation and angles in a fan-like way and create a soft dynamic appearance. Besides their aesthetic function, the balconies are meant to make the smaller apartments look bigger from the inside. With living units ranging from 430 to 538 square feet, the balconies add another 182 square feet of space. The north-facing façade toward Ragnitzstrasse includes a pergola that reduces traffic noise and is mounted in a way that makes it look almost transparent from the west.